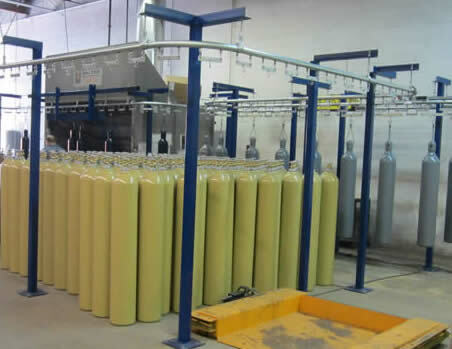 Certified Cylinder Service (CCS, Inc.) operates a maintenance and refurbishing facility for compressed gas cylinders in Ontario, Canada. With some of the most advanced hydrostatic testing equipment available in the market, Certified Cylinder also does Hydrostatic Re-qualification and has played host to Transport Canada inspectors for equipment training. Certified Cylinder is also an approved vendor for Linde, Air Liquide, Praxair and many other Canadian gas suppliers. The company has grown steadily over the last five years and has recently installed a second test station that is unique in their industry. Since opening its operation 5 years ago, Certified Cylinder had relied on an entirely manual system for transporting their cylinders through the paint and finishing process. Cylinders were rolled, lifted and moved all using human labor. With the business growing, Scott Robinson knew that some automation would be required in order to maintain the volume of output with any degree of efficiency. 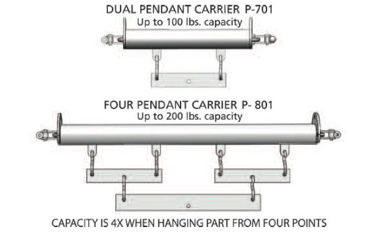 minimize the lifting of cylinders by the operators. reduce the drying time of the cylinders between paint applications. allow operators to easily rotate the cylinders while painting. avoid paint run off during transportation of the cylinders from the paint booth to the drying area. In addition, Scott needed the new system to be in place NOW, so he was looking for a company who was capable of providing a very quick turnaround. Scott contacted Robert D’Alesio at Pacline Overhead Conveyors to discuss the project. With over 15 years of experience at PACLINE, Robert knew he could address all of the issues at hand using the PAC-LINE™ model enclosed track conveyor system and a few creative ideas. Working closely with Scott, Robert was able to incorporate an inexpensive lifting device to raise the cylinders up to the conveyor hooks above the ground. By utilizing various load bar configurations, cylinders with different weights could be easily handled on the same PAC-LINE™ conveyor system. Once painted, all cylinders could remain on the conveyor for transport to the drying area. Small cylinders less than 50 lbs. could be hung directly from the chain pendant on 6 inch centers. For medium size cylinders up to 100 lbs. on a dual load bar configuration on 12 inch centers was used. Larger cylinders up to 200 lbs. 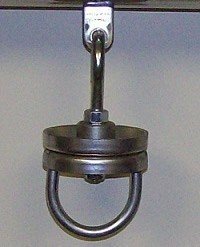 were hung on a four-pendant load bar with 24 inch centers. Earl Munroe, PACLINE’s fabricating supervisor and Robert developed a simple custom hook design that would handle all types of cylinders. This was all tested in PACLINE’s conveyor testing facility. Robert recommended Pacline’s RC-705 rotator, which allowed the cylinders to be rotated automatically during the painting process. The need for the operator to manually rotate cylinders while painting was completely eliminated. To further reduce operator effort and enable safe load and unload of the heavy awkward cylinders, Robert reconfigured the electrical schematics of the controls. These controls allowed the operator to run the conveyor in continuous mode while painting and in jog mode while loading the cylinders. Certified Cylinder was concerned about the down time required to complete the system design and installation – they needed to be back in production as soon as possible. PACLINE was able to meet this request for Certified Cylinder. Thanks to the experienced project engineers, skilled installation staff, large inventory of conveyor components and the unique bolt together design of the PAC-LINE™ overhead conveyor, Certified Cylinder was back up and running sooner than expected – in just two weeks. The new automated finishing system by PACLINE not only exceeded Cetified Cylinder’s expectations on delivery but more importantly it successfully addressed all of the customer’s needs and improved productivity for Certified Cylinder by almost 50%! That’s a worthwhile investment and a great choice!